"It doesn't count till' she's conscious Rose." "Hey Bella, is he going to let you practice too?" 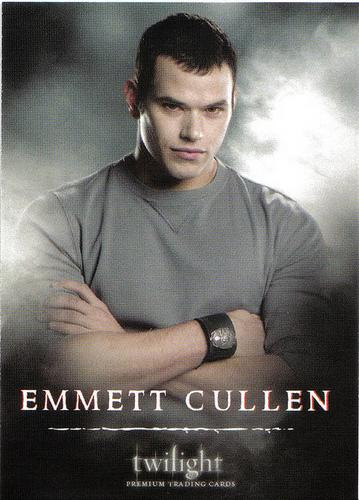 Emmett McCarty Cullen was born in 1915, and was turned into a vampire in 1935 by Carlisle Cullen. During Emmett's early life, before he became a vampire, he worked on the railroad with his older brothers. Rosalie Hale found him being mauled by a black bear in the mountains of Tennessee. Emmett nearly died, but Rosalie carried him over a hundred miles back to Carlisle. It took nearly all of Rosalie's strength not to kill Emmett. She was afraid if she tried to save Emmett she would end up killing him. He described the experience as "being saved by an angel who brought him to God". 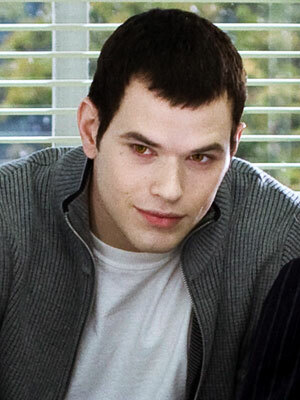 Emmett was soon changed into a vampire. Many years later, Rosalie confessed to Bella that she saved Emmett from dying because of his innocence, dimples, and curly hair that reminded her of her best friend Vera's child, Henry, and that ever since the day she saw Henry she always wanted a baby just like him. After his painful transformation, Rosalie and Carlisle explained to Emmett that he was a vampire. This did not upset him like Rosalie and Carlisle had thought it would. He put in his own words, "Hell's not so bad if you get to keep an angel with you." He did initially have trouble adjusting to the Cullens' rule of only feeding on animals, and has tasted human blood on several occasions. He had even run into two strangers whose blood appealed to him like Bella's to Edward, causing him to lose control. Emmett later married Rosalie. 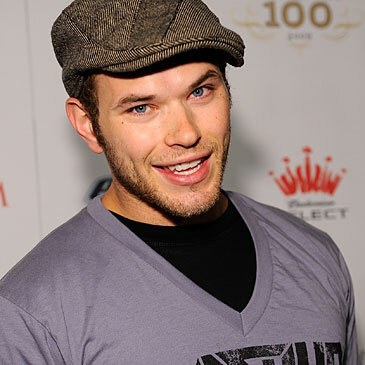 Kellan Christopher Lutz was born on March 15, 1985 in Dickinson, North Dakota. He is an American film and television actor who is best known for playing Emmett Cullen in the Twilight Saga. Before acting, he was an Abercrombie and Fitch model. Lutz is the middle child of one sister and six brothers. He started modeling when he was 13 or 14 years old. Lutz has acted on a number of television shows. He had recurring roles on "Model Citizens" and "The Comeback", and smaller roles in episodes of "The Bold and the Beautiful", "CSI: NY, Summerland", "Six Feet Under", "CSI: Crime Scene Investigation", and "Heroes". Lutz played Emmett Cullen in the film adaptation of the book Twilight by Stephenie Meyer and reprised his role for the sequel, released in November 2009. He will be reuniting with his Twilight co-star and close friend, Ashley Greene, in the film "Warrior". Lutz also appeared in "A Nightmare on Elm Street", and as Poseidon in "Dawn of War". Lutz is one of the candidates for the lead role in the upcoming Norway Comedy horror movie "Hansel and Gretel: Witch Hunters". He is also one of the models featured in the 2010 Calvin Klein X underwear campaign. In Lutz's free time, he likes to take part in extreme skateboarding, weight training, track, baseball, basketball, lacrosse, swimming, tennis, badminton, snowskiing, snowboarding, dance, and other activities. He also has a passion for horror films, and prefers to perform his own stunts when making films. He has close friendships with his Twilight co-stars, particularly Ashley Greene and Jackson Rathbone whom he knew before the filming of The Twilight Saga began. He says that his 23rd birthday was spent with the cast, saying, "I hung out with the cast of Twilight and went on a crazy adventure with a loony cab driver". Lutz supports animal charity PETA and stars in a video supporting the adoption of animals instead of buying them.